India Aerospace & Defense Market size was over USD 10 billion in 2016 and is predicted to grow at an estimated CAGR of over 5% from 2017 to 2024. Initiatives undertaken by the government to make India self-reliant in terms of defense requirements is expected to drive the India aerospace & defense market over the forecast timeline. The country’s attractiveness to the global companies is increasing, owing to the increasing defense budget. For instance, according to a report by Nasscom and IESA, the total India aerospace & defense market opportunity for aerospace and defense electronics is estimated to be approximately USD 70 billion in next 10 years. Growing need to modernize the equipment is expected to further drive the industry. The government announced the Long Term Integrated Perspective Plan, that undertakes the modernization of armed forces by 2027. Factors such as hostile neighborhood and unrest in North-East India & Kashmir are driving the modernization agenda, thus propelling the India aerospace & defense market growth. The industry has witnessed growing focus on the development of high-end technology and reduced reliance on exports. Air application is expected to hold a majority share in the India aerospace & defense market, owing to the growing demand for efficient and environmentally friendly aircrafts. Need to increase the size of aircraft fleet with additions of auxiliary airplanes such as rescue aircrafts, medic aircraft, repair & emergency aircrafts are expected to propel the growth. The government is introducing various methods and newer technologies for air traffic management and adhere to strict environmental & air traffic regulations. This is expected to attract several global players such as Boeing in the industry. Land security solutions are expected to witness substantial demand in the India aerospace & defense market, owing to the increasing need from the domestic/homeland and border security. Increasing volatility in domestic peace and increasing government initiatives is encouraging the players to expand their capabilities and extend their product portfolio. Cybersecurity is expected to witness rapid growth owing to the rising instances of cyber-attacks such as Wanna Cry, life-threatening software such as Blue Whale, and malicious data thefts. Growing demand for safeguarding cyber networks and the country’s data infrastructure is fueling the cybersecurity market demand. The number of providers is expected to rise during the forecast timeline, with increasing investments from various global players such as Thales Group. The border security segment is expected to grow remarkably in the coming years, due to increasing threats from neighboring countries. The demand for optical and radar equipment is on the rise to better equip the soldiers on the borders. The MTS services segment is expected to gain traction in the India aerospace & defense market, owing to increasing need to cut the costs and outsource these services to the third-party players. Growth in demand of extended battery life for products and increasing replacement cycles to enhance efficiency is anticipated to be one of the major factor for the increasing demand for MRO services. The MRO services are expected to witness fast growth, owing to the increase in demand for repair operations for the equipment in the industry. The aero-platform MROs are expected to grow at highest rate, owing to the extended life of aircraft, their subjection to harsh environments, and need for frequent repair operations. Prominent players in the India aerospace & defense market include Bharat Forge, companies in Ordinance Factory Board, Bharat Electronics Limited, Bharat Dynamics Limited, Mahindra, Reliance Defense, Tata Power Strategic Engineering Division, and Tata Advanced Systems Limited. 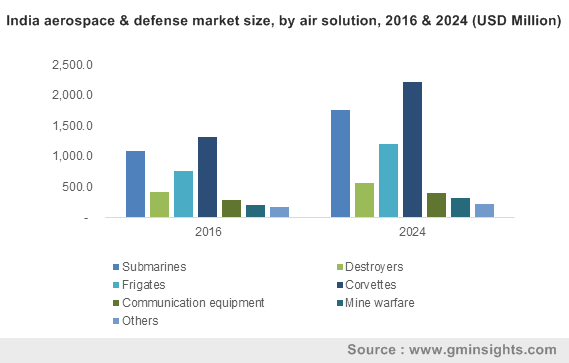 In addition to domestic players, global players participating in the market include Northrop Grumman Corporation, Thales Group, Lockheed Martin Corporation, Honeywell international, Inc., and BAE Systems. The increasing FDI and the offset policy introduced by the government is attracting many global players in the country. These players are forming joint ventures with Indian counterparts to gain share. As of 2015, India was the sixth largest importer of arms, primarily from countries such as Russia, France, and the U.S. Increasing government initiatives such as Make in India or Buy from India is expected to encourage the domestic manufacturers to enter the industry to reduce exports and increase imports of these equipment. Introduction of offset policy enabled the component manufacturers to enter the India aerospace & defense market. 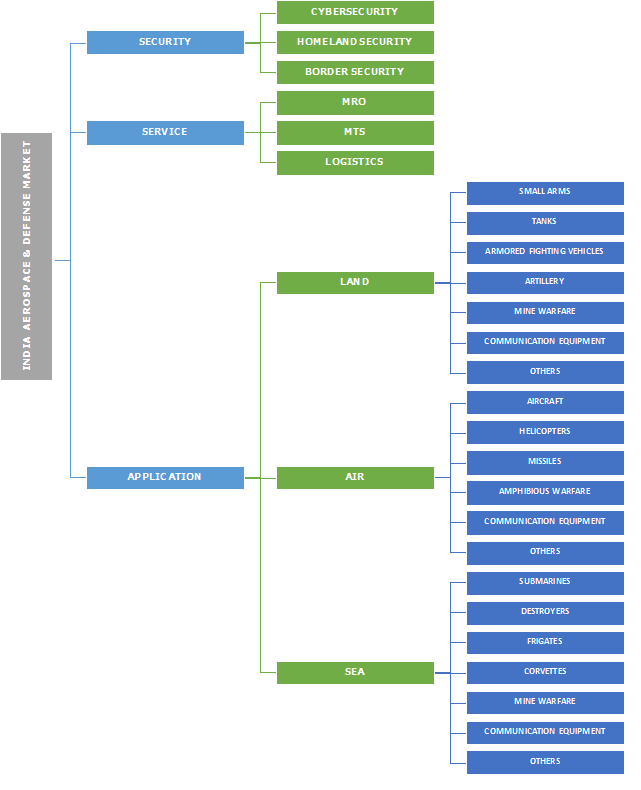 Traditionally, the country had the presence of only Tier III and Tier II component suppliers. However, with the growth in favorable business environment, the number of Tier I suppliers and manufacturers & system integrators is expected to grow significantly over the forecast timeframe.